California did stand out with a 4-point gain for eighth-graders’ reading scores. It tied with six other states for most-improved in that category, in which scores rose for nine states and the District of Columbia. California’s fourth-graders gained 3 points. California’s 1-point gain in math scores was not a significant change, a spokesman for the National Center for Education Statistics said. Los Angeles, San Diego, and Fresno — the three California school districts included in the results — all improved in fourth- and eighth-grade reading. In math, San Diego improved in both grades. In Los Angeles, fourth-grade math scores declined but rose 3 points for eighth-graders. In some ways, the flat trajectory nationwide provides relief for educators after the especially bitter NAEP news in 2015, when scores dropped for three out of four age/subject groupings. The development came as states were still rolling out testing regimes aligned with the Common Core, and the new standards were widely (and controversially) blamed for bringing down student performance. USC education professor Morgan Polikoff also acknowledged that growing performance disparities could be caused by social factors. Three school districts in California were among 21 nationwide that reported scores for both 2015 and 2017: Los Angeles, San Diego, and Fresno unified. In reading, these California districts took the top three places among fourth-graders. San Diego was in first place, gaining 6 points. Fresno took second place, with Los Angeles in third. The average for the 21 districts was a 1-point decline. In eighth-grade reading scores, Los Angeles came in fourth and San Diego fifth, both with a rounded average increase of 3 points. The top gains were 4 points each in Albuquerque, Hillsborough County, Fla., and Boston. Fresno was up 2 points. The average for the 21 districts was a 1-point increase. In math, fourth-graders in San Diego came in second place with a 5-point gain. Fresno was in third place with a 4-point gain. Los Angeles matched the group’s average, with a 1-point decline. Eighth-grade math scores put Los Angeles in second place, up 3 points, behind the District of Columbia. San Diego was in fourth place, up 2 points. Fresno declined 2 points. The group averaged a 1-point increase. Los Angeles Unified’s fourth-graders who qualified for free or reduced-price lunch, a poverty indicator, lost 2 points in math. There was no change for fourth-grade English learners or students with disabilities. 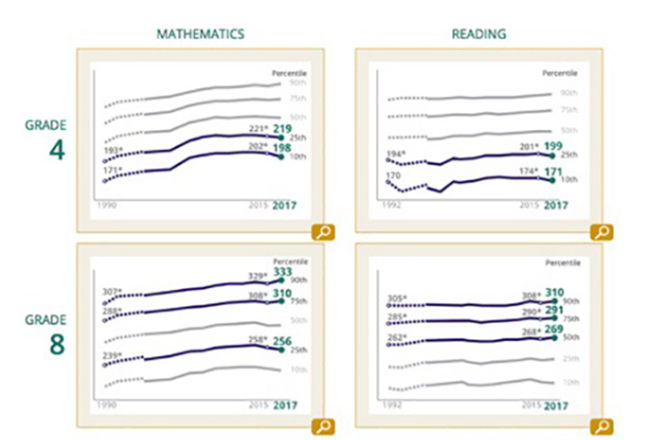 In reading, fourth-graders in poverty rose 3 points, while English learners rose 6 points and students with disabilities rose 10 points. Eighth-grade students in poverty increased their math scores by 1 point, while those with disabilities rose 7 points. There was no change for English learners. Reading scores for eighth-graders in poverty rose 3 points, English learners rose 6, and those with disabilities rose 7 points. LA School Report’s Laura Greanias contributed. This article was published in partnership with the74million.org.